Offering you a complete choice of products which include Shrink Wrap Machines such as Automatic Shrink Wrap Machines (Web Sealer), Automatic Shrink Wrap Machines With Automatic Cutting, Automatic Sleeve Inserting & Shrink Machines, L Sealer With Tunnel, Semi Automatic Shrink Wrap Machine (Web Sealer) Sleeve Wrap, Shrink Tunnel and many more items. By keeping track with the technological development, we are offering optimum quality Shrink Wrap Machines.Our offered wrap machines are precision-designed by our skilled professionals using superior quality components and modern technology in sync with industry norms. The provided wrap machines are widely praised by our prestigious clients for their different quality attributes. 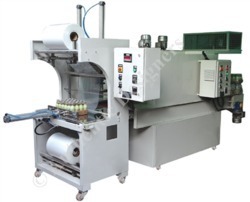 So as to ensure the quality, these wrap machines are checked by our quality experts. 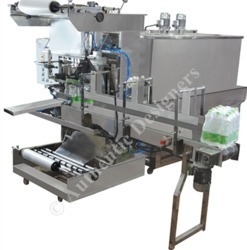 Product size:12" x 10" or 14" x 18"
This Machine used for Product like Jar, Cans and jugs etc. curved bottles from different Industries such as Beverages Industries Such as Beverages Industries, Pharma Industries, Food Industries etc. Special catcher system to hold the empty bottle upside down. Speed rotary system ensures product rotation. Product feed and Discharged from same point. Special type rotary design for perfect shrinking quality. This machine used for Cans , jar, jugs, Dahi Cup, Ice cream etc. Roller Conveyor or wire mesh conveyor as per product characteristics. Shrinking Empty Bottles up to 2 Liters & Mini Cans. Film Use PVC Shrink Film etc. 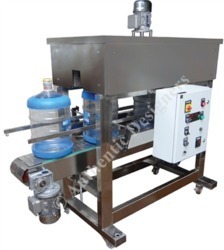 Our organization has gained recognition as a flourishing organization for providing Shrink Tunnel Machine that has catcher system to hold the empty bottle upside down. The offered tunnel machine is manufactured using superior quality components and advanced technology by our skilled professionals. Moreover, our provided tunnel machine can be availed in variegated specifications and sizes as per the requirements of our clients. As per the variegated requirements of our clients, we are offering a broad collection of Automatic Sleeve Inserting Machines. 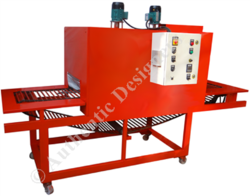 The offered shrink machines are highly acknowledged in the market due to their different quality features like high speed. Our provided shrink machines are manufactured using quality tested components and modern technology in sync with industry norms. 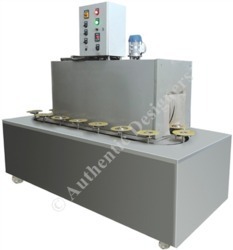 Moreover, these shrink machines are tested on varied parameters. We are reckoned amongst the most trusted name engaged in offering a superior quality range of Semi Automatic Shrink Wrap Machine. Boxes, bottles, jars, metal components, stationary, can etc. Bottle Size: up to 1000 ml. Power: 12 – 15 Kw, 3 phase. (Connected). Our association has picked up acknowledgment as a prospering association for giving Rotary Shrink Tunnel Machine for Cosmetic Industry that has catcher framework to hold the unfilled jug upside down. The offered passage machine is produced utilizing unrivaled quality parts and propelled innovation by our talented experts. In addition, our gave passage machine can be benefited in variegated particulars and sizes according to the necessities of our customers. We are passionately engaged in offering a wide assortment of Shrink Tunnel For Jar Neck. 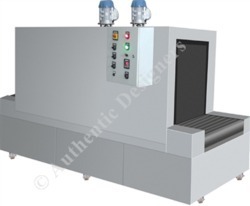 We offer of Semi Automatic L Sealer with Tunnel. This is high-speed conveyorized Semi Automatic L Sealer with Tunnel.